HUNTINGTON, W.Va. – Maybe it was the presence of Hal Greer's family in the front row. Maybe it was the rambunctious and disruptive crowd of 7,687 who made the Cam Henderson Center electric for the hosts and uncomfortable for the guests. Maybe it was Jannson Williams' go-ahead 3 … or Taevion Kinsey's career high … or Jon Elmore, again, collecting a game-winning assist. 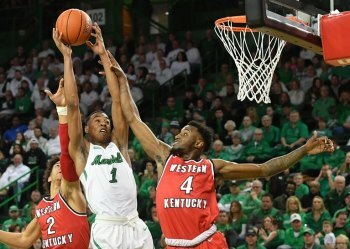 "Great team win," Elmore said after Marshall, the defending Conference USA men's basketball champions, rallied from 15 points down to knock off the league's preseason favorite, Western Kentucky, 70-69 on Saturday night. "The fans fueled us the whole game," Elmore added. "We were down what seemed like the whole game until the very end. We slowly chipped away." How did the Thundering Herd, down 38-23 with 2:46 left of the first half, accomplish that? "I thought we locked in on defense," Elmore said. Once again Dan D'Antoni's team, with an offensive reputation and a knack for shattering scoring records, beat WKU on the other end of the floor. The Hilltoppers (8-8, 1-2 C-USA) shot 55 percent from the floor in the first half and held an 11-point break at intermission. After the break, WKU made 40 percent of its shots and managed only 8 points in the final eight minutes. After scoring 42 points in the first half, the Hilltoppers scored 27 in the second half. "I knew it was going to be a fight," Kinsey said. "Even when we were down I felt like we were going to turn it around." Kinsey, a 6-foot-5 true freshman, was a big part of that turnaround. He scored a career high 23 points – 9 better than his previous best – and scored 15 in the second half. He had multiple put-backs in the second half, scored on a driving dunk, was the recipient of an alley-oop, completed a three-point play and scored twice in the final five minutes to help get the Herd within striking distance. "Taevion Kinsey was obviously extremely good," D'Antoni said. "Jannson hit a big, big ol' shot." Williams, a 6-9 sophomore, took a pass from Elmore at the top of the key with 21 seconds left of regulation and Marshall trailing by 2 points, 69-67. The ball swished through the basket and the Henderson Center crowd roared. "Jannson hit that big shot," D'Antoni said. "Jon's trying to go in there and I told Jannson to just stand out there and Jon if you can't find anything throw it to Jannson and let him shoot. That's twice Jon's trusted his teammates. He didn't force a shot." conference play in the last four seasons. Marshall's last first half lead was at 13-11 with 15:33 left. Taveion Hollingsworth scored twice in 42 seconds to give WKU a 15-13 lead it held until Williams dunked a lob from Elmore with 1:45 left of the second half to tie it at 67-67. Williams' heroics came two trips down the floor later. Kinsey finished 9 of 14 shooting and played a full 40 minutes for the second consecutive game. He had a team high seven rebounds, equaling his career best. Elmore shot 6 of 16 from the field and finished with 21 points while adding a game-high five assists. Williams was the only other double-digit scorer for the Herd with 12 points. He also scored the game's first 5 points, giving Marshall a quick early lead that quickly evaporated. The Hilltoppers led for 33 minutes and 56 minutes. The Herd went a span of 8:07 in the first half without a field goal. Williams tied a career high with five blocks. He now has 59, which is tied with Robert Goff (2011-13) for No. 16 in Marshall history. Williams has played 51 career games. C.J. Burks needed one 3-point attempt for 500 in his career, but instead he did not take a 3 for the first time at Marshall. Saturday night was Burks' 109th game with the Herd. Burks became the 17th player in Marshall history to reach 1,500 career points. Burks' two assists moved him past Sidney Coles for No. 18 in program history. Burks has 269 career assists. Marshall has won five of the last seven meetings with WKU. The Hilltoppers hold the edge in the series, 15-12. Saturday's win was the Herd's seventh in a row against C-USA competition. The last MU loss against a conference opponent was at UAB on March 1, 2018.